Do you need a HEPA filter? What is a HEPA filter? Have you every asked yourself this question? HEPA stands for High Efficiency Particulate Air. As the name implies this is a high efficiency air filter. This filter is very good at removing stuff from the air. The picture on the left is an example of what a HEPA filter looks like. In order to be a HEPA filter, the filter has to remove 99.97% of all the particles 0.3 microns in size from the air. This includes pollen, dust, dust mites, pet dander, tobacco smoke, bacteria and mold. Particles of this size are called most penetrating particle size or MPPS. These are the most difficult to filter out of the air. A micron is one thousandth of a millimeter. In other words: its pretty darn small. A human hair is about 100 microns. So we are talking about really tiny things here. These things are too small to see with your eyes. HEPA filters are made by randomly arranging fibers into a mat. Usually these fibers are made from glass. The diameter of the fibers is 0.5 to 2 microns in diameter. If the holes in the filter are bigger than 0.3 microns how can the filter stop particles 0.3 microns and smaller? When most people think "what is a HEPA filter?" they think of an air filter like a sieve, or strainer. A sieve can only stop things that are bigger than its largest holes. Interception: This means that the particles fly straight into a filter fiber and get stuck. This is the way a regular filter works. Impaction: This mainly affects the larger particles. 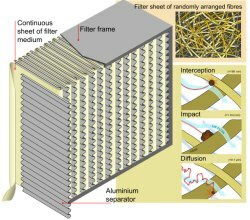 As the wind carries the larger particles along, the wind curves around the fibers in the filter. Because the particles are moving along quickly and they are heavier than air, when the air curves around the fibers the particles keep going straight and collide with a fiber and get stuck. Diffusion: This mainly affects very small particles, about 0.1 micron and smaller. These particles hit gas molecules in the air. Because they are so small and light they bounce around instead of traveling in a straight line. Since they are moving around much more they have a much greater chance to hit a filter fiber and get trapped. You never knew that asking the question What is a HEPA filter? would take this long to answer did you? Lets take a brief look at the history of HEPA filters? HEPA air filters we first designed in the 1940. The US government was conducting nuclear test and using HEPA filter air purifiers it could prevent the spread of airborne radiation. In the 1950s HEPA filters begin to be commercialized and they were used in other industries to filter the air. Since then these filters have been continuously improved upon to do more and more work. You can buy HEPA filter air purifiers, HEPA furnace filters for your furnace, or HEPA filter for a vacuum. What is a HEPA filter? In our opinion they really are the best air filters our there. Today a HEPA air cleaner filter is highly efficient. Any filter that can meet the same filtering standards by removing 99.97% of the particles in the air can be called a HEPA filter. What is a HEPA filter? It is not a filter that advertised that it is HEPA-Type, HEPA-like, or 99% HEPA. While these filters are still good filters and capable of removing 99% of the particles from the air, they are not genuine HEPA air purifier filters. Very efficient at removing particles larger than 0.3 microns. What is a HEPA filter? What does all this mean for you? Do you need a HEPA filter? If you want cleaner air, have allergies, or have asthma then a HEPA filter as part of you air filtering system would be a very good idea. Check out the rest of our reviews to find out which air purifier is best for you. One word of caution. A HEPA filter gets clogged up and it does need to be maintained and cleaned or changed regularly. Check with the manufacturer or the owners manual. Some air purifiers have a permanent HEPA air filter. The manufacturer of these air cleaners recommend that you vacuum out the filter every 3 months. In an air cleaner filter replacement should be a priority. A clogged filter will not clean the air very well. Check the owners manual to find out the correct air cleaner replacement schedule. Usually this is between 3 months and 1 year. We recommend that you always have a replacement HEPA air purifier filter on hand in case you need it. The next time YOU hear someone ask this question you will be able to answer it for them. Leave What is a HEPA filter? Page and Return to Air Purifier Filters Page. Leave What is a HEPA filter? and Return to All About Air Purifiers Home Page.